2.1 Reply to specific messages...Threaded messages? A new version of Allo is rolling out just in time for the holidays. If you're thinking about singing Christmas carols or wishing somebody a happy new year, things are going to get a little more interesting thanks to the latest update. 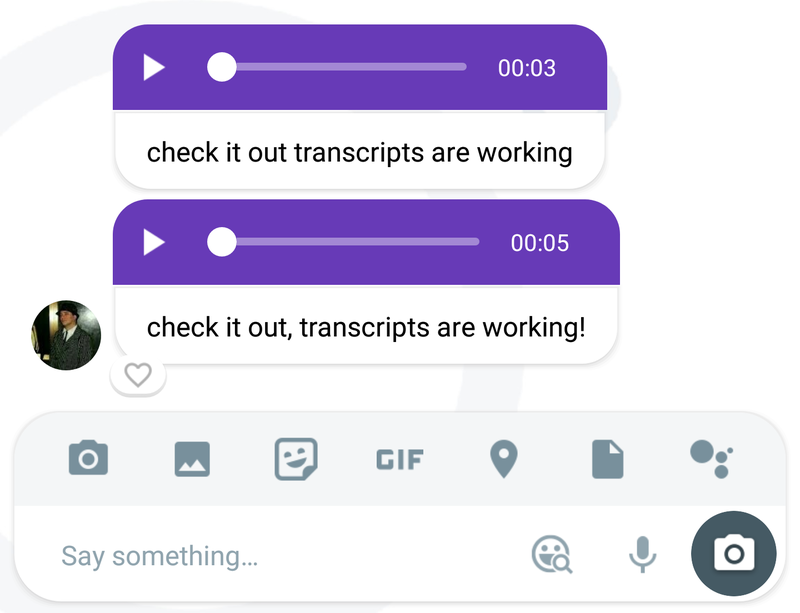 Your audio messages will now be automatically transcribed to text, so people can decide when to listen and have some idea of what they're going to be hearing. There's also a clue that may suggest threaded conversations will be supported. We're still poking around for other changes, but let us know in the comments if you stumble across anything else. Audio transcriptions were first revealed in a teardown of Allo v22. They work a lot like language transcriptions except that they occur automatically, so no long-press is needed. The transcription usually takes a couple seconds to appear after the message is received. 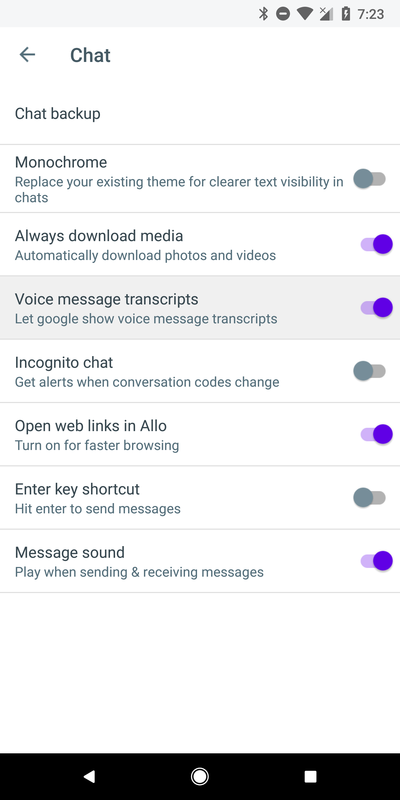 If you don't like having the transcriptions, you can go into Settings -> Chat and turn off Voice message transcripts. Just be aware that you can't long-press on the audio message to manually request a transcription. It's probably worth noting that video messages are not transcribed. But who knows, maybe Allo will do that next. 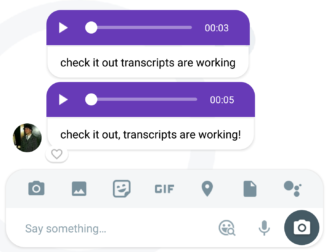 The transcriptions work just like voice dictation, so they will be pretty literal and won't insert any punctuation based on pauses or other audio clues. On the other hand, that means you can speak your punctuation and it will be appropriately converted for the transcripts. For the screenshot above, I spoke 'comma' and 'exclamation mark' as part of the second message. Of course, that will sound pretty weird to somebody that hears the message, so you might want to consider how the recipient is likely to consume the message. Reply to specific messages...Threaded messages? We already know from a previous teardown of v24 that a new floating context menu is in the works. It looks as though a new action may be a part of it: Reply. 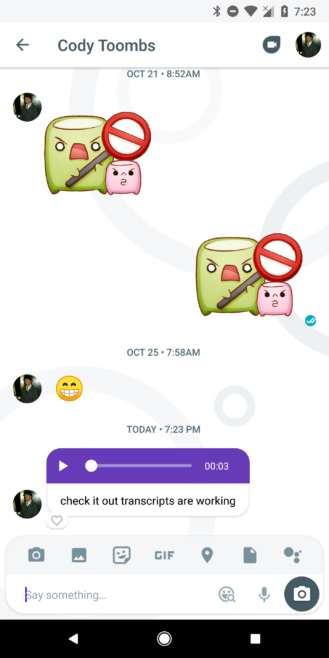 In the framework of Allo messaging that we currently know, replying to a message simply means that you're posting a new message to the bottom of the chat. However, if there's going to be a specific action for replying, it likely means Allo will soon branch out into threaded conversations. Most people will probably associate threaded conversations with the group chat service Slack (pictured below with a threaded message). For those that aren't familiar, threaded conversations allow users to add replies that are attached to a specific message, treating it almost like a sub-topic to be discussed further. It can be used in solo conversations, but threading is particularly effective in group chats where the majority may spin off into many directions. At this point, we're just looking at a single line of text, or rather, a single word with a name that lends a little credibility to the theory. However, rumors have been floating around that threaded conversations were in development, so this one clue may be a confirmation that this is indeed happening.